JAWS changed Peter’s and my life and put us on a 30-year journey to help educate the public about the importance of protecting sharks and all the creatures of the sea. We were stunned by the phenomenal popularity of JAWS and the way in which it transcended generations then, as well as now. Peter’s fictional depiction of the great white shark as a terrifying monster inadvertently tapped into people’s deepest fears. We were shocked and saddened by, as Peter said, "the momentary spasm of senseless macho shark killing” that occurred in the book's wake, but we were enormously gratified by the many people who have told us over the years that Peter’s book triggered great interest in learning about sharks and a desire to protect them. Peter (who always imagined himself as a budding Hooper) and I had the great fortune to travel around the world with top-notch marine scientists, oceanographers, videographers, and photo journalists – world class ocean minds - to study and learn about sharks, their habitats, and the enormous challenges that overfishing and shark finning (among others) pose to their very survival. The knowledge we gained and the advances the scientific community has made to better understand shark behavior underscore what Peter said many times - that he could never write the same JAWS again. The consummate ocean advocate, Peter wrote many books and countless articles and wrote and narrated dozens of documentaries about both the wonders of marine life and the threats they face. I would like to acknowledge my heartfelt thanks to the gifted photographers and writers who helped us bring this website to life, sharing stunning ocean photography and vivid reflections of Peter’s work, including David Doubilet, Brett Gilliam, Carl Gottlieb, Howard and Michele Hall, and Brian Skerry. This site is dedicated to sharing Peter’s and my work and carrying on what I believe is his greatest legacy: inspiring individuals across a wide range of marine disciplines to seek out new ideas, new thinking, and new solutions that will protect sharks and our seas forever. And, this also includes you. We need people like you to learn about sharks and to help protect these magnificent creatures. They are not only fascinating, but they are essential to keep our marine ecosystems healthy for all ocean wildlife. I encourage you to learn about the groups listed on our website, or any other group involved in ocean conservation that inspires you. You can make a big difference for the oceans, and you will make the legacy of JAWS a noble one. 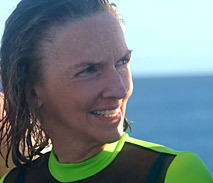 Advisory Trustee for the Environmental Defense Fund, International Board Member of Wild Aid, and Co-Founder of the Peter Benchley Ocean Awards for the Blue Frontier Campaign.